Kyphoplasty, or Balloon Kyphoplasty, is a minimally invasive surgical procedure – that does not require surgical incision – commonly used for compression fractures in the spine caused by weakened bones. This spinal procedure stabilizes the compression fracture. The most common causes of a vertebral compression fracture are trauma such as a fall, motor vehicle accident; or bone diseases such as osteoporosis and certain types of cancer. Usually, there is severe pain associated with a vertebral compression fracture or, sometimes, no symptoms at all. Compression fractures can also result in a progressive spinal deformity. For example, when multiple compression fractures occur, it causes Kyphosis or dowager’s hump. The surgery is performed under sterile conditions in the operating room with the patient under general or local anesthesia lying prone (on the belly) on the operating table. The surgeon in charge of the Kyphoplasty or Balloon Kyphoplasty procedure will make small incisions, on either sides of your back. Through these incisions, a narrow tube is introduced to the fractured vertebra under X-ray imaging or Fluoroscopic guidance to allow accurate insertion. 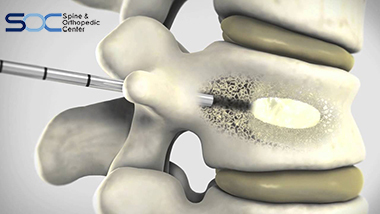 Through the inserted tube, a special balloon (this is why it’s called Balloon Kyphoplasty) called a bone tamp is introduced into the vertebra. Once the balloon is in place, it is gently inflated to re-establish the pre-fracture vertebral body height. The balloon is removed and the space is filled with orthopaedic cement known as polymethylmethacrylate (PMMA). The cement hardens in a few minutes, stabilizing the bone. This procedure restores the normal height of the vertebrae and minimizes the deformity. After the procedure is executed, the incisions are closed. The entire Kyphoplasty surgery takes about an hour, for each vertebra. Most patients are discharged home on the same day and allowed to walk as soon as they are awake. You should have a companion to drive you home. The incision needs to be kept clean and dry. Avoid heavy lifting or strenuous activities that can increase the propensity of a fracture in osteoporotic patients. Closely adhere to the post-operative instructions you receive at the time of discharge. In case of any complications or medical emergency, contact your doctor immediately. Most Kyphoplasty patients experience immediate pain relief after the Kyphoplasty surgery is performed. Although Balloon Kyphoplasty is a minimally invasive surgical procedure, there may be certain potential risks and complications associated with a Kyphoplasty surgery as with any major surgery which include bleeding, infection, bone cement leakage, damage to the spinal cord or spinal nerves, increased back pain, and numbness and tingling.